Since everyone has a bit of each of the four primary factors, it is important to understand that the mix of levels or elevations determines how much governance these four factors will have over your behavior. In this article, we are going to talk in depth about the Influence factor’s potential negative impact. We explore when it is appropriate to dial it down. A word of caution regarding ethics: By situationally adjusting your Influence factor, you must make certain that you are using it to make the situation better. Never plan to use it in a scheming calculating way and always think of Noble Intent. In general terms, an elevated Influence factor gives you an extroverted, relaxed style that can be useful when you need to persuade others to help you or when you want them to open up to you. 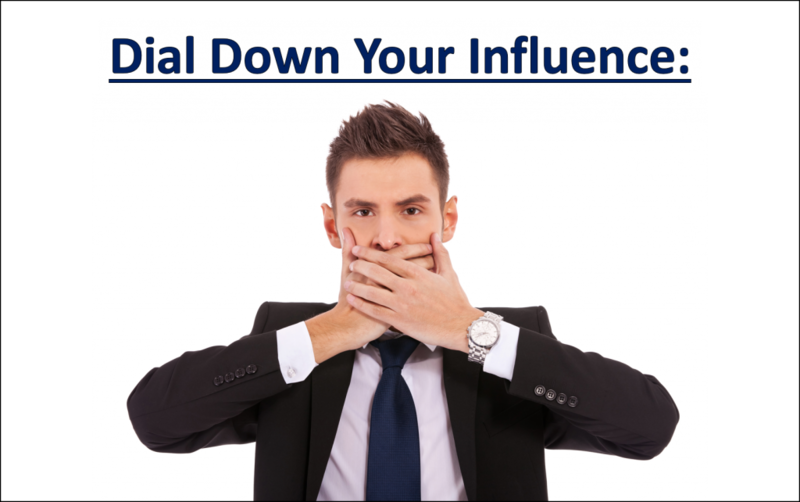 Although this is highly desirable in most situations, in some cases, you must learn how to dial down your Influence factor. This may come during a group meeting on a team project or when speaking to individuals one-on-one. You must learn how to dial down your influence when the situation calls for less friendliness or diplomacy. And think about this: Although it might seem counterintuitive if someone views you as very good at influencing others – that you already have an elevated and highly skilled Influencing factor, this can work to your detriment in an influencing situation. If people know that your skill level is far superior to theirs in the influencing arena, they become more guarded and in a strange way, your heightened talent has worked against you. When you suspect this, it is critical to know how to dial down the perception of your elevated Influence factor. This doesn’t mean that you forego influence and refrain from using influencing tactics; it just means that you dial down their impact significantly in order to make others feel more at ease. Let’s discuss specific instances when you might make the choice to dial down your influence factor. Imagine a project team just getting started. The team leader’s goal is to make sure the team members get to know each other’s strengths and weaknesses and to make sure that they bond to form a cohesive unit. Now jump forward. The team has been operating for a few months and deadlines are looming. But a couple of the team members are consistently late to meetings and critical deliverable dates slip. This is creating stress because the person next in line finds that they have to work overtime to catch up. It seems that the team leader has created such team camaraderie that the people think it’s ok to let their teammates down as long as they apologize for doing so. You might need to dial down influence to address this and hold people accountable for their behavior. This doesn’t mean that you don’t communicate effectively, it simply means that you deliver your message in a less easygoing manner. You are more forthright and pointed. The same is true whenever you need to hold people accountable. Examine precisely how you communicate your expectations and performance guidelines. For a team to be efficient and productive, the team members must all be held to a certain standard. The type of message a team leader must deliver sounds something like this: “Promises to other team members are important. Business is business and fostering team spirit is different than thinking it’s ok to become a little lax in your responsibilities to your teammates. Letting teammates pick up the slack every once in a while, when you get in a crunch is fine but when it becomes a habit, it is not effective teamwork.” By delivering this type of message in a more efficient rather than friendly manner, you dial down your customary Influence factor to make a point. This is usually enough to make sure people get the message. Another example is when you are in a position where you need to get the facts right or when you need to be in a purely objective state of mind. Getting rid of emotional involvement is critical when you put yourself into the 3rd perceptual position. In order to truly put yourself into this state, you need to dial down your Influence factor and significantly dial up your Steadiness factor. It doesn’t take much to understand that if you are in an emotional state or in a mode where you are thinking about whether other people will like you rather than respecting your rationale and judgment, that you might not be as impartial as possible. Finally, when you are in the tactic mode because the influence factor deals primarily with establishing the initial motivation and inspiration for a project, reliance on the influence factor at an elevated level when trying to accomplish the project’s deliverables can lead to problems like missed deadlines, unfulfilled objectives, and inefficiencies. When you have decision making authority to exercise; consider dialing down your influence factor and dialing up your Dominance and Steadiness factors. The problem with an elevated influence factor is that it skews the decision-making process toward group consensus or putting together ad hoc teams. Rarely is authoritative decision making the first option when the Influence factor governs. But authoritative decision making if you remember from the decision-making course, authoritative decision making is the hallmark attribute of a respected leader. When situations require it, the leader needs to be the final decision maker and set their vision into motion by making authoritative decisions. Be warned: The influence factor can hinder this ability. As you think of situations in which your elevated Influence factor might hinder your performance, you can use these immediate steps to dial down your influence when it can help propel you forward. When you need to get things done, or you need to become completely focused and objective, you can’t afford to be social. Close your door and tell everyone that you’ll be unavailable for a while. This will help you to focus on dialing down your Influence factor and building up your other primary DISC factors rather than talking to others. It’s perfectly acceptable to tell everyone else to stay away for a while, while you get things done. This type of behavior – closing your door and not interacting with other people – can be a major issue for a naturally elevated Influence individual. This is because they need frequent interaction to remain satisfied and happy. It is often painful for them to be alone for extended periods of time. It is hard for the influential person to say no when someone wants to talk to them. Make sure that you understand this might make you miserable at first but in the long run, having periods of uninterrupted alone time for planning, strategizing, or simply recharging your batteries will be highly beneficial. If you’re trying to convince someone to come around to your point of view, don’t keep repeating yourself. Plan your message – ideally targeting precisely what your audience would love to hear and say it just once. Because naturally elevated Influence individuals are passionate in communicating, they often approach things by repeating and reiterating their strongest points. But this can also cause them to appear redundant or scattered. Plus, people with an elevated Dominance factor, in particular, will become annoyed and lose interest if you repeat yourself too often. Dial down your influence by just saying it once and then move on. If you are trying to curb this tendency, just assume that the person listening will understand precisely what you are trying to say the first time you say it. Thinking like this goes a long way in changing your behavior and helps dial down a negative trait of an elevated Influence factor. If this worries you, remember that you can gauge whether they are willing to pursue the issue further if they bring it up again. Only then should you delve back into the topic. While in a meeting or talking to someone in your personal life, let the other person do most of the talking. Curb your enthusiasm as a messenger. Concentrate on the other person’s message instead. Sit back and really listen without interrupting their words. It is especially important to squash your self-talk when you are listening. You should not let it interrupt your thoughts either. Concentrate on paying close attention to what they are saying. An elevated Influence factor can sometimes cause you to feel the need to interject. Perhaps you feel compelled to keep the conversation flowing during moments of silence. By doing this, you end up actually taking control of the dialogue and this is not always beneficial. When the other person finishes talking, it’s okay to be silent. The other person might truly appreciate you giving them a few moments to think and reflect. An excellent influencing tactic is to actually let someone convince themselves rather than you are persuading them. When you let other people talk, you might find that you don’t need to use your influence factor as much as you think. By letting the other person think and talk through a situation they’ll often come to the conclusion you want them to. Just listen and make sure their logic is going along the track you want by proving cues like nodding and smiling. If they veer off track you can interject but don’t jump in too fast. Often, it talks aloud they’ll counter argue against their own flawed logic. You may find that they will keep talking and they will be the ones taking control of the situation and thinking of the idea that you wanted them to accept. This is an excellent way for you to practice dialing down your influence factor. An elevated influence factor puts too much emphasis on talking rather than action. It’s easy to help if you are tuned into what other people’s goals are. Figure out what you can do to help them by being aware. Don’t ask them, be proactive, and just do it. Take the initiative to find an opportunity to help out, even if it is a small task. Your team members will appreciate your efforts and see you as more of a go-getter than just being a social butterfly who talks to them and commiserates but doesn’t pitch in. Let’s listen to a personal example that exemplifies what it means to take the right kind of action, without having to ask others for what they want. There is a story about a man who stopped at a local flower shop to wire his mother, who was two-hundred miles away, some roses. Outside of the shop, the man noticed a little girl sobbing on the curb. He asked the little girl what was wrong, and she explained to him that she wanted to buy a single rose for her mother, but she only had seventy-five cents of the two-dollar price tag. He bought the rose for the girl and offered to take her home. She agreed, but only if he would take her to her mother. The little girl directed him to the cemetery, where she placed the single rose on her mother’s freshly dug grave. The man, touched by the girl’s actions, went back to the flower shop and canceled his wire order. Instead, he took the roses himself and drove the two hundred miles to his mother’s home to personally deliver the flowers. We can all learn that taking just an extra step, without asking other people, can help create better relationships with the people in our lives because of the thoughtfulness that preceded the action. Quite possibly one of the biggest weaknesses of an elevated Influence factor is its lack of focus and its willingness to go in different directions much as conversations lead from subject to subject depending on the interests of the current speaker. These traits cause behavior that focuses more on talking through the problem’s fixes in circuitous ways – leading here and there without discipline or clear focus. An elevated Influence factor loves to debate possible solutions rather than spotlighting finding the actual reason why the problem exists in the first place. When this happens, you need to dial up your Dominance factor to counterbalance the impact your elevated Influence factor has. It is absolutely critical if you want to dial down your influence factor to review the session 2 of the Decision-Making Course. In this session, you will learn how to identify the problem and how to use specific techniques such as the Fishbone Diagram and the 5 Why’s model to the root cause of a problem. This is a great way to improve your ability to situationally flex your behavior so that your influence factor does not sidetrack you away from the actual problem that you need to solve. After completing the immediate steps to help you dial down your influence factor, there are some secondary steps that you can take to build upon your skills. Each step can be useful in helping you to foster a different set of abilities to manage situations and bring about better results. Most often people associate the Dominance factor with control but an elevated Influence factor desires control over relationships and communication. Don’t try to manipulate every situation you are in. Sometimes the influence factor can lead you past influence and bring you into an area where you are manipulating outcomes and people. This can be disastrous in your long-term career or your long-term relationships with other people. While working with a team, let others make connections and work together. Don’t allows be the orchestrator, peacemaker, and networker. If there is an argument that ensues, stay back and let situations work themselves out. Although you are used to influencing or manipulating people to work together or solve the problem, let them bring out ideas to figure it out. If you are not an expert in the decision that needs to be made, sometimes your involvement can hinder the process. Look through the facts. Are you really the best person to influence the decision or action? The influence factor causes almost erratic behavior at times that can jump around from place to place very easily. The focus is not one of the strengths of the influence factor. In fact, many people with a naturally elevated Influence factor love to multi-task and love a variety of activities buzzing around at once. But, persistence is required to commit and finish most tasks. A highly elevated influence factor can interfere with and undermine this goal. This might make it hard to maintain concentration on following processes that need to be accomplished to reach the end goal. And following through with tasks might mean that you have to curb the elevated Influence factor’s tendency to disrupt the single-mindedness required for complex assignments. Taking ideas and putting them into a plan that can actually be implemented is essential for the elevated influence individual to become skilled at. Sometimes the enthusiasm of new ideas can be motivating, and goodness knows that people with an elevated influence factor love talking about and debating new ideas! But you have to remember to annex an implementable action plan to put the idea into practice. This requires dialing down influence and gearing up thoughtfulness by amping up the Steadiness factor. Fleshing out action plans can help determine if your ideas will bear fruit. By going through an analysis process like a SWOT or a pros and cons exercise, which we’ll discuss next, you may realize the strengths and weaknesses associated with actually carrying out your vision. Putting together a model for how your idea will work in practical terms is necessary to avoid obstacles and threats while simultaneously capturing the most profitable and beneficial opportunities. The influence factor can inhibit linear thinking because of the enthusiastic nature that it brings about in a person. When you get excited and inspired, ideas flow fast and furious. This is the influence of creativity in motion. While this is great, at some point you have to nip it in the bud. Often that point occurs when you move ahead toward action. Then you will need to learn to dial down the influence factor when you need to bring your idea to action. A 24-year-old, pregnant mother, sought a way to increase her family’s income. She did not have much money, just the two-thousand dollars saved from her wedding gifts, but she nevertheless proceeded to use the money to submit an ad to Seventeen magazine. She was promoting personalized handbags and belts. At the time, putting initials on a person’s products was a revolutionary idea. Lillian Katz decided to implement her idea with the slogan, Be the first to sport that personalized look. Her business grew, eventually growing into the Lillian Vernon Corporation, with annual sales of one-hundred-forty million dollars. Action-oriented people realize those who want milk should not sit in the middle of a field and wait for a cow to back up to them. Lillian Katz did not wait for someone to offer her an opportunity or for some investor to agree with her about her idea. She took her ideas and translated them into an implementable action plan. Weigh The Pros And Cons before making a decision. An elevated influence factor can lead you to make decisions in an undisciplined manner. If you get caught up in discussions where people get excited and in the heat of the moment make the decision that hasn’t been properly thought out yet you corrupt the Rational Decision Making Process. Snap decisions, spontaneous excitement, and spur-of-the-moment choices are things to watch out for if your influence factor is in overdrive. In this regard, the influence factor is more associated with the Intuitive Decision-Making Process, which can be skewed by individual perceptions and Groupthink. Dialing down the effect of an elevated influence factor will give you a distinct advantage when it comes to making decisions. If you take the sessions on the Rational Decision-Making Process in the Decision Making Course, you will find yourself with an improved skill set that will help you in a plethora of different situations. Groupthink affects every factor, whether you are falling into it or causing it. Sometimes you may actually use your influence to cause Groupthink without even realizing it. Make sure that you are NOT using this to get your ideas put into action. From a logical standpoint, others can significantly improve your ideas and give you input on your strengths and weaknesses. You do not want to put into action a half-baked idea that will inevitably fail. Watch your influencing skills when you are putting forth an idea. Make sure that one person is the Devil’s Advocate that will stimulate debate. If your goal is to dial down your influence factor to the optimum level, make sure you complete the activities in the activity section. I hope you have enjoyed the steps on how to dial down your influence factor. Be sure to incorporate each of the four primary factors into your life as the situation warrants. Behavioral flexibility is the key to your success.